John Warner (W), Gary Poole (W), Carlos Garz�n (A), and Frank Bolle (A) Flash is back! 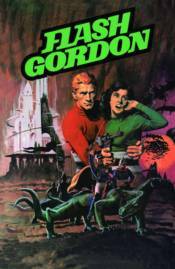 The intrepid science-fiction hero returns in a new volume collecting the full run of Flash Gordon comics published by Gold Key in the 1970s. Thrill to the adventure as Flash battles shark men, evil robots, lava men, and every twisted scheme the villain Ming the Merciless can invent! Featuring sharp storytelling and classic artwork, Flash Gordon Comic Book Archives Volume 4 revisits an action-packed era in the history of one of comics' most enduring heroes.